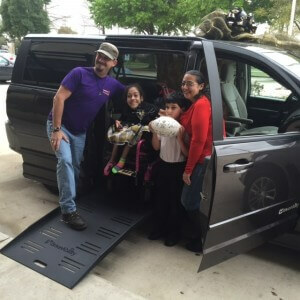 Last December, the Mayeaux family's wheelchair accessible van sputtered out of life for the final time in the driveway. The once great asset of mobility was reduced to a pile of resting steel. Melissa Mayeaux, however, only saw her daughter's need for mobility. Lauran was born with arthrogyposis, a rare disorder that means she was born without skeletal muscles below the neck. The 13-year-old honor student and her family used that van for everything. Lauran and her mother got to work raising funds to put a down payment on a new vehicle as soon as possible. Their efforts caught the attention of Fox 8 local news, who picked up their story and shared it on their evening broadcast. The news station owner was watching their story that evening. 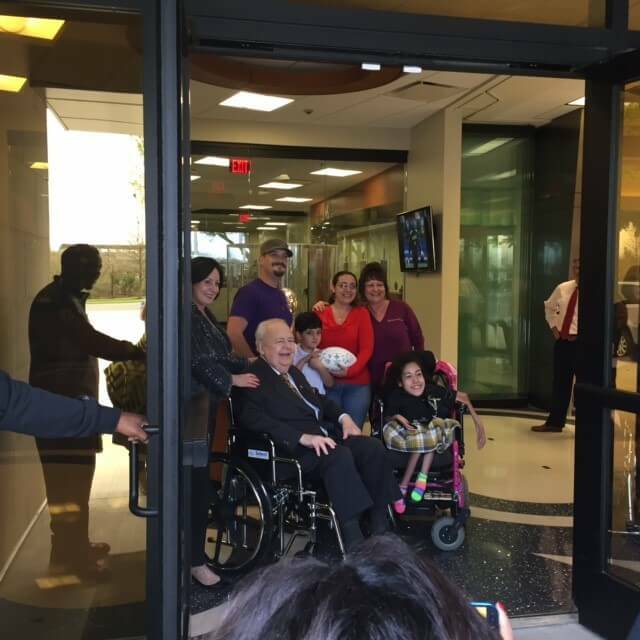 That man was Tom Benson, who just so happened to be the owner of the New Orleans Saints football team and New Orleans Pelicans basketball team. After hearing their story, Tom and his wife, Gayle, knew they wanted to help out the family in any way they could. That notion led the Mayeaux family to the New Orleans Saints training facility on Thursday, March 12. The family thought they were there to tour the facility in addition to Melissa being interviewed as a strong mother in the community. That was only the surface of the events that the day would hold. Tom Benson worked with Crescent Vans, a BraunAbility dealer, to secure the family a brand new BraunAbility vehicle. During the Mayeaux's tour, the Bensons surprised the family and presented Lauran with the key to the vehicle. "It's fabulous," Lauran said. "It smells really good, too. I love it so much." The Mayeaux family was currently using a free rental van, courtesy of Crescent Vans. Melissa and her husband have raised several thousand dollars to put toward a down payment on a new vehicle. They now plan to use that money to install a wheelchair accessible bathroom in their home. Lauran was all smiles that day after meeting a pair of New Orleans saints who looked nothing like football players. "We wanted to help out. And that's what happened," Tom Benson said. "You can see how great it is, too. What a wonderful thing for a wonderful young lady. Glad to be a part of it." To see local news coverage of the event, you can follow these links to the Fox 8 story and the New Orleans Saints coverage of the event.